Using the same hook size and varying the body size may help to improve your luck in high or low water conditions. For example, in high, off-color water a large dark fly can be more effective because fish can see it better; however, in low, clear water a smaller fly may work better because it won't spook the fish as easily. 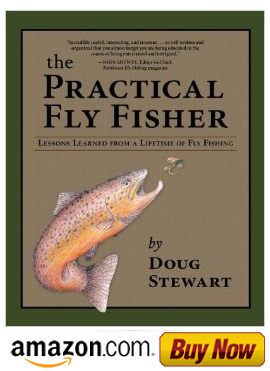 It is not necessary to tie the fly on a smaller or larger hook for each varying water condition. You can simply use the same hook size, say a No. 6 hook for steelhead, and just increase or decrease the body size. For example, in the fall steelhead can be reluctant to take a full bodied fly on a No. 6 hook. But, if you just reduce the size of the body you tie on the No. 6 hook, the fish will often take that smaller version of the same pattern.